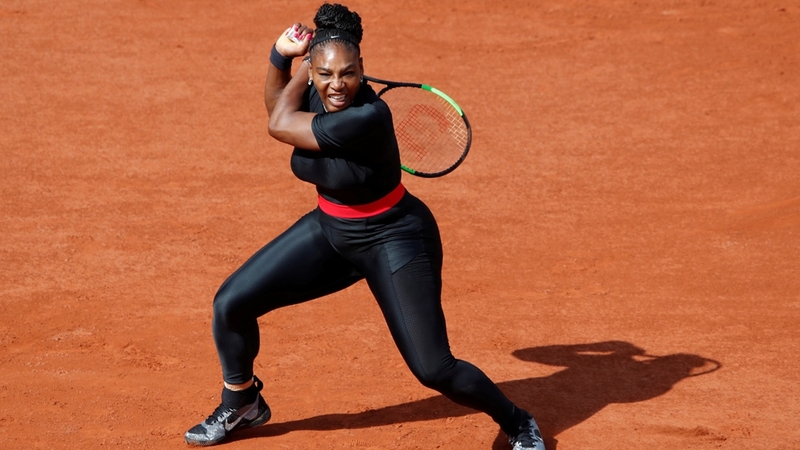 Social media users have slammed a decision to ban a catsuit worn by US tennis champion Serena Williams as part of changes to the dress code at the French Open. French Tennis Federation President Bernard Giudicelli singled out Williams’ black and red outfit, which she wore at the tournament in May, in an interview with Tennis Magazine saying “certain limits” would be imposed on player’s uniforms going forward. The comments have prompted a lively debate on social media, with users attributing the decision to racism, sexism and ignorance. Others have questioned the wisdom in banning an outfit which was specially designed by Williams’ sponsor, Nike, for health reasons. Williams told reporters after she first wore the outfit in May that the skin-tight material helped avoid blood clots, which caused her to have a pulmonary embolism after giving birth in September. “I’ve been wearing pants, in general, a lot when I play so I can keep the blood circulation going. It’s a fun suit, but it’s also functional so I can be able to play without problems,” she said. Rafi D’Angelo, a blogger, said in a series of posts on Twitter that the ban was about men telling women what to wear and white men “continuing to be uncomfortable with Serena’s body”. Serena Williams, who wore an outfit specifically designed to help prevent blood clots because she almost *died* after giving birth, won’t be able to wear her catsuit again at the French Open because the tournament chief…doesn’t like it. After playing in May’s French Open, Williams said the outfit made her feel like a “warrior”. “I call it my Wakanda-inspired catsuit,” she said, referring to the fictional African country which is home to the Marvel superhero Black Panther. A photo of Williams in her catsuit next to a 1985 shot of former US tennis player Anne White wearing a long-sleeved white bodysuit has been widely shared by social media users who say it shows a double-standard in clothing restrictions for white and black women. At the time, White was asked to wear something more “appropriate”. For the record, Serena Williams wasn’t the first woman to wear a catsuit at a Grand Slam. Anne White did it in 1985 at the US Open. They knew this was a possibility but didn’t ban it until Serena did it for MEDICAL REASONS. Kristen Clarke, president of the US-based Lawyers’ Committee for Civil Rights Under Law said the decision was “racist and sexist” and reflected how black women’s bodies are subject to increased restrictions. “Arbitrary dress code policies have been disproportionately used to target Black women in schools, at work and now on the tennis court. This is the unfair policing of Black women’s bodies,” she said on Twitter. The French Open banned Serena Williams from wearing her Wakanda-inspired catsuit again. She said the suit helped her avoid blood clots — like the ones that almost killed her after the birth of her daughter. Many social media users took exception to the suggestion that Williams choice of outfit showed a lack of respect for tennis. “The French Open needs to learn how to respect the GREATEST OF ALL TIME and stop telling Serena Williams what to wear,” environmental activist Ryan White said in a post on Twitter. The 36-year old is considered one of the greatest tennis players of all time, having won 23 singles grand slam titles, the second-highest number for a female player after Australian former tennis player Margaret Court’s 24. The French Open needs to learn how to respect the GREATEST OF ALL TIME and stop telling Serena Williams what to wear. Giudicelli’s comments came on Friday, as Williams topped Forbes’ annual list of highest paid female athletes, having taken home some $18.1m between June 2017 and June 2018. Williams, who is currently training for September’s US Open, has not responded to the comments but did not attend a pre-tournament press conference yesterday because she was feeling “under the weather,” according to a tournament announcement. Giudicelli did not offer specifics on what the new dress code would entail, but said it would not be as strict as those in place at Wimbledon, where players are required to wear white. The next French Open will be held in May 2019 and many player’s uniforms have already been designed but Giudicelli said the FFT would be asking manufacturers for an advance look at them.